Most people find the concept of envelope budgeting fairly intuitive. You put your money into various envelopes designated for various spending categories, like Rent, Groceries, Cell Phone, etc. When you spend from one of those categories, you take the money out of the appropriate envelope to cover the expense. This works if you have physical envelopes stuffed with cash, or if you a use a personal finance software like Banktivity to manage “virtual envelopes” for you. That’s a super quick refresher on the basics of envelope budgeting. If you are new to envelope budgeting, take out a look at this great resource we’ve put together that covers the concepts with some additional detail. In today’s post we are going to cover some of these more complex and also pretty common situations when envelope budgeting. Since envelope budgeting is about the money you have right now and deciding what to do with the money you are paid, let’s start with a paycheck. Many people think of their paycheck as one number – the amount that shows up (usually via direct deposit) in their checking or savings account. But for most jobs, at least if you have a have a job where you get a W2, there are other important numbers in your paycheck, like federal withholding, social security and medical deductions and sometimes, automatic transfers to some of your other accounts, like a 401k or savings account. To track all of the components in a paycheck you need to “split” the transaction in Banktivity. 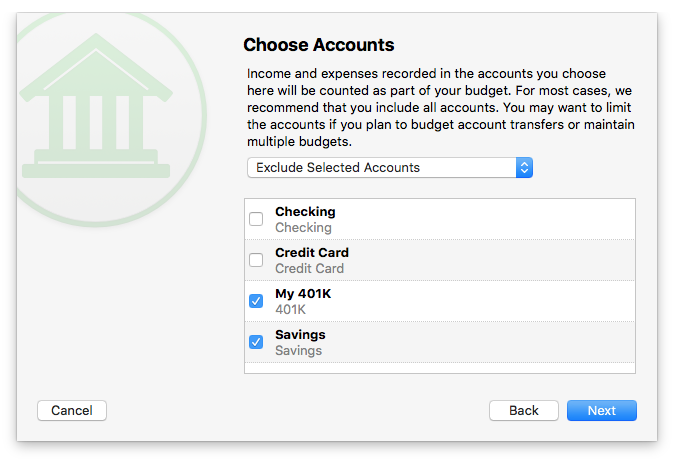 Since we don’t readily have access to the federal withholdings, social security and medical deductions in an envelope budget, I’m going to run through an example of how to track money you have automatically transferred to a savings or retirement account. Since the $100 and $200 are part of your budget, they represent a saving priority. So let’s discuss the proper way to handle this in an envelope budget. First, since you plan on moving money *to* these accounts, we will want to exclude them from the budget. This tells the app that when I move money to these accounts I want to think of it as an expense, in that it will decrease the amount of money I have for other things. Now when you get paid and you record the split transaction either manually (or you could post it via a scheduled transaction) your envelope budget will show -100 in your Savings Account envelope and -200 in your 401k envelope. As expected, your Salary envelope will show $2,000. You’ll want transfer $100 and $200 to your Savings and 401k envelopes, respectively. Now you have funded your Savings and 401k and you’re left with a net amount of $1,700. Perfect! Envelope budget showing you need to move some cash from your paycheck envelope to your Savings and 401k envelopes. Just click the red numbers to bring up a popover widget where you can move money to the envelope. Now, when you go to your budget, you’ll see $50 available in your Savings envelope. You can then transfer this to whatever envelope is appropriate. After you transfer $50 from Savings to Checking, you free up $50 that was in your Savings to distribute to other categories. Loans and other debt instruments, for better or for worse, are a part of life for almost all adult Americans. There are school and car loans, mortgages and home equity line of credits, just to name a few. (I’m not even going to cover revolving credit area like credit cards as they are another beast in and of themselves.) For budgeting we think of the loan as having some minimum monthly payment. For example, you might have a mortgage that has $1200 minimum monthly payment. 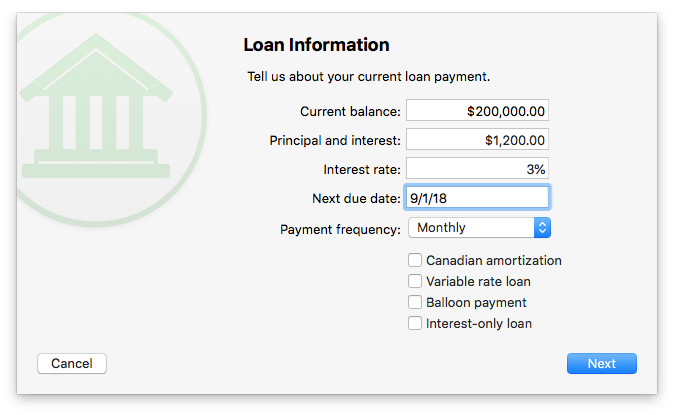 You tell Banktivity about the remaining principal, interest rate and your total monthly payment; the app will calculate the interest and principal automatically for you. 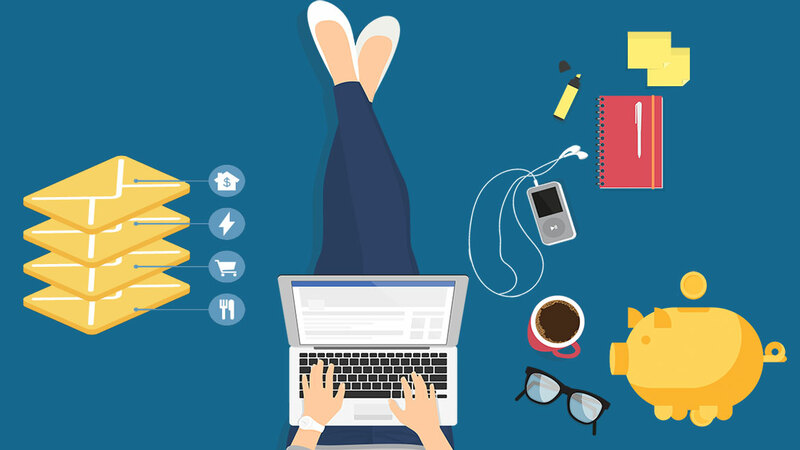 On the last screen of the budget setup assistant it, Banktivity gives you the option to schedule interest and fees separately. You definitely want to check this box if you want to budget for this loan as one lump sum. When you check this box, Banktivity will actually make two scheduled transactions behind the scenes for you, one for the total amount of the monthly payment. This scheduled transaction is setup as a simple transfer from the account you plan to pay from to the loan account. Then, there is another scheduled transaction setup that posts to the loan account that is for your interest, PMI, insurance, etc. 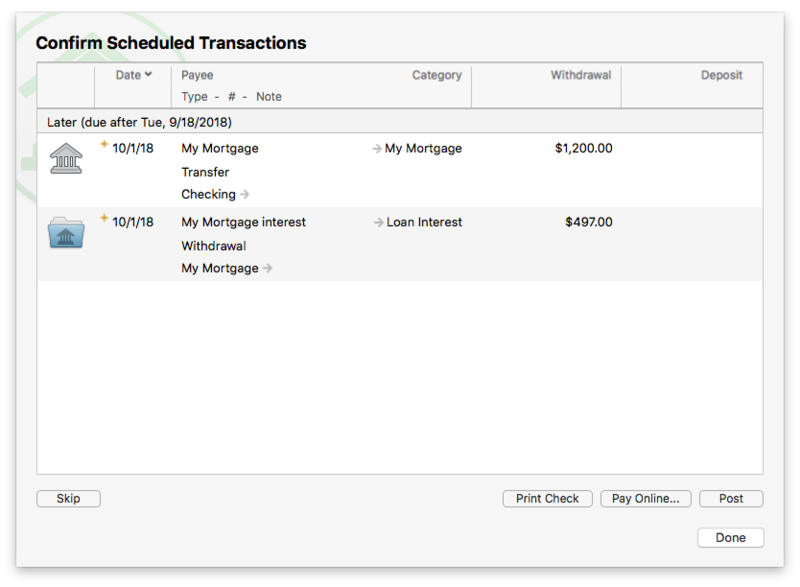 When you post the first scheduled transaction all of the amount is applied to the principal of the loan (you might be thinking this is incorrect, but don’t worry, the next transaction brings everything back into balance). Then when you post the second transaction it will correctly adjust the principal balance of the loan and track interest and any other splits. Every month when you make your mortgage payment you’ll post both of these transactions from the Confirm Scheduled Transactions sheet. When you look at your budget, you’ll see one transaction for the total amount – this is the amount you’ll want to transfer your envelope dollars into each month. 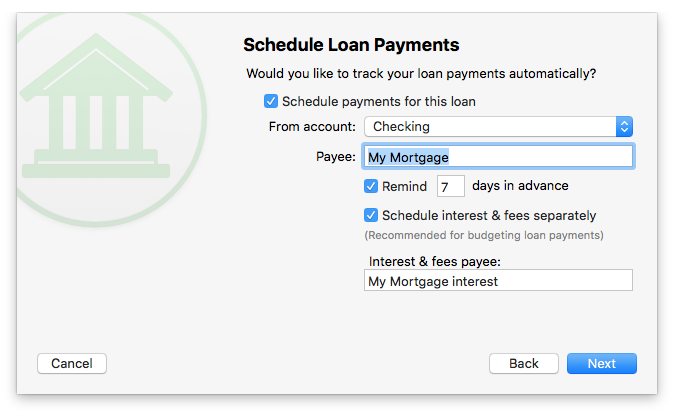 Two scheduled transactions are created so that you can budget for what makes sense on a monthly basis while also accurately tracking your loan principal and interest. As many of you know, I’m a big proponent of envelope budgeting, but I also like to keep fairly meticulous financial records. With Banktivity you can have the best of both worlds: a real-world zero-based envelope budget and records that accurately track interest and transfers directly from paychecks. Do you like envelope budgeting with Banktivity? Do you have any questions about best practices? If so, let us know in the comments. This post is brilliant. I have been trying to work this out for months. I can’t check it worked for me until I next get paid, but it sounds like it is just what I was looking for. One question I have is, in my salary split where I have addd the savings expenses, in your example $100 and $200 my split and the dot in front of it, yours does not. I know the dot means another account, not a category. Is this correct? I also have fixed at the end of each row. What is that for? I have made a scheduled transaction for the day after pay day to transfer the $100 and $200 is that correct? I under pay myself each month as I also get a bonus. I was wondering if I should add a bonus category to the split and add my bonus there. At present I just change the salary amount when I reconcile my accounts. This did not help. Clearly, I am too stupid to understand your stupid budgeting system. I’m really sorry to hear this! Please let us know which specifics you are having trouble with. This post definitely covers a fairly advanced setup. There appears to be something incorrect with this tutorial, or at least very confusing. You have both CATEGORIES and ACCOUNTS named exactly the same “My 401k” and “Savings”. Makes sense I do the same to track the category in the budget but have an actual account where the money exists. On the first screen shot you split the paycheck between CATEGORIES. Then in the budget the categories appear with a negative balance until cash is moved into the “envelope”. Still tracking at this point. The next part is where my experience with your software differs. In the fourth screen shot you do a transfer from the Savings ACCOUNT to your checking account. To be clear this is recorded as an account to account transfer. Categories are not tracked. When returning to the budget the $50 in your example will not be tracked in the envelope because the transfer was not not tagged to a CATEGORY. In the budget the savings “envelope” will be unchanged. But under budgeted income there is a “Savings” entry with the $50 cash. It can then be moved from the income section to whatever envelope you desire since it is a new source of cash (income). The “Savings” envelope in the budget created by the CATEGORY “Savings” will not be effected by the transfer unless you fund the envelope from the new $50 income. I have avoided envelopes precisely because of this issue. I have always been afraid that the software would track this transfer as “new” income and thus skew my yearly earning report. If I am missing something please advise. I have spent countless hours in your budgeting software and have never been able to create a scenario that you detailed in your article. I love Banktivity and use the budget every month… I just have to keep the envelopes turned off. For the example in this article I do NOT have a category named Savings. I only have the account named that. When you tell the budget to exclude a specific account, the system essentially treats it much like a category. So when I move money from Savings to Checking, the system sees that as money available to disperse from the Savings account. Seems like it would help to have the accounts distinguished in the budget as what they technically are: accounts, not categories. I should have been more clear. In my example, I have accounts named Savings and My 401k. They are NOT categories. I’ll update the screenshot to make that more clear. It seems redundant to have to manually split the transaction and then also manually recreate that split by moving money from one envelope to another. I have just done the above and the split put the money into my savings account automatically. I assume this is because in my salary it had a dot in the category and that is the account. I then had a schedule transaction to put the money in the account, but that led to two payments. In my budget it was shown as an expense when it should have been income into my savings account. The above looks so close to what I want, but isn’t quite there yet. I have just tried this and it doesn’t work for me. When I do the split for paycheck and indicate the amount I want to transfer into my Savings account as savings, Banktivity lists the amount as being transferred FROM my Savings account, as opposed to going into the Savings account. You may think this petty, but it’s not for a lot of people like me who don’t swear. I was so surprised to find any swearing in a financial software training post, of all things. I expect to find it in social posts, etc. But here, it’s totally unnecessary and off-putting. Please, You could have said, “Stuff happens,” like most people do when wanting to respect those who refrain from swearing. Please consider a change for the sake of youth who might want to use your software. my mortgage Payment changed because of a change in escrows. How do I change it? For my mortgage, the “Edit Loan Information” is not highlighted and therefore does not allow me to edit it. Am I missing something? My guess is that the account type is wrong. In Banktivity 7 you can double click the account to change the account type.